Type 1 diabetes occurs when the body's own immune system destroys the insulin-producing cells of the pancreas (called beta cells). Normally, the body's immune system fights off foreign invaders like viruses or bacteria. But for unknown reasons, in people with type 1 diabetes, the immune system attacks various cells in the body. This results in a complete deficiency of the insulin hormone. Some people develop a type of diabetes - called secondary diabetes -- which is similar to type 1 diabetes, but the beta cells are not destroyed by the immune system but by some other factor, such as cystic fibrosis or pancreatic surgery. Normally, the hormone insulin is always secreted by the pancreas in low amounts. When you eat a meal, food stimulates an increase in the amounts of insulin released from the pancreas. The amount that is released is proportional to the amount that is required by the size of that particular meal. So what does insulin do? Insulin's main role in the body is to help move certain nutrients -- especially a sugar called glucose -- into the cells of the body's tissues. Cells use sugars and other nutrients from meals as a source of energy to run a variety of important processes for the body. When glucose is moved into cells, the amount of sugar in the blood decreases. Normally that signals the beta cells in the pancreas to stop secreting insulin so that you don't develop low blood sugar levels (hypoglycemia). 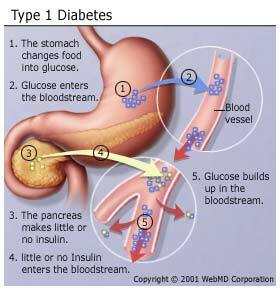 But the destruction of the beta cells that occurs with type 1 diabetes throws the entire process into disarray. Diabetic ketoacidosis (DKA). Without insulin and because the cells are starved of energy, the body breaks down fat cells. One of the products of fat break down is a specific type of acid that can be used by the brain for energy. Unfortunately none of the body's other cells can use this acid for energy, and thus continue to starve without insulin. So, the liver releases the sugar it stores to help out. Since the body cannot use these sugars without insulin, more sugars piles into the blood stream. The combination of high excess sugars, dehydration and acid build up is known as "ketoacidosis" and can be life-threatening if not treated immediately. Doctors don't know all the factors that lead to type 1 diabetes. Clearly, the susceptibility to the condition can be inherited. Doctors have identified that an environmental trigger plays a role in causing the disease. Type 1 diabetes appears to occur when something in the environment -- a toxin or a virus (but doctors aren't sure) -- triggers the immune system to mistakenly attack the pancreas and destroy the beta cells of the pancreas to the point where they can no longer produce sufficient insulin. Markers of this destruction -- called autoantibodies -- can be seen in most people with type 1 diabetes. In fact, they are present in 85% to 90% of people with the condition when the blood sugars are high. If your health care provider suspects diabetes, he will first check for abnormalities in your blood (high blood glucose level). In addition, he may look for glucose or ketone bodies in the urine. Many people with type 1 diabetes live long, healthy lives. The key to good health is keeping your blood sugar levels within your target range, which can be done with meal planning, exercise and intensive insulin therapy. All people with type 1 diabetes must use insulin injections to control their blood glucose. You will also need to check your blood sugar levels regularly and make adjustment of insulin, food and activities to maintain a normal sugar level. Retinopathy. This eye problem occurs in 75% to 95% of adults who have had diabetes for more than 15 years. Diabetic retinopathy in type 1 diabetes is extremely rare before puberty no matter how long they have had the disease. Medical conditions such as good control of sugars, management of hypertension and regulation of blood lipids are important to prevent retinopathy. Fortunately, the vision loss isn't significant in most people with the condition. Poor blood circulation. Damage to nerves and hardening of the arteries leads to decreased sensation and poor blood circulation in the feet. This can lead to increased risk of injury and decreased ability to heal open sores and wounds, which in turn significantly raises the risk of amputation. Damage to nerves may also lead to digestive problems such as nausea, vomiting and diarrhea.